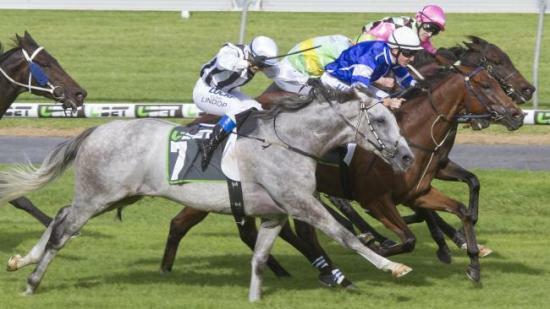 DAYTONA Grey can go at least some way to making amends for a missed shot at Group 1 glory when he steps out at Morphettville on Saturday. The classy sprinter has returned to racing in peak form this campaign but was scratched from last week’s Group 1 Goodwood after suffering some minor foot issues. Co-trainer Leon Macdonald said the six-year-old gelding had recovered from those problems and was primed for a forward showing in Saturday’s $50,000 Alan Sheppard Constructions Handicap on the Parks circuit at Morphettville. Daytona Grey, to be ridden by 2kg-claiming apprentice Caitlin Jones from barrier nine, shares the second line of betting with Shaf at $6 in early UBET fixed-odds markets for the 1250m race. The promising former NSW galloper Voodoo Lad holds clear favouritism at $2.30 at his second start for the all-conquering Darren Weir stable following a comprehensive first-up win on a heavy track at Warrnambool. Daytona Grey has delivered top-shelf performances at each of his three runs from a spell, resuming with a hard-finishing win in the Listed Manihi Classic on April 9 before being beaten just 1½ lengths when sixth in the Group 3 Irwin Stakes behind Nostradamus. He produced another stellar effort at his most recent outing when second to the flying Super One in the Group 3 McKay Stakes a fortnight ago.